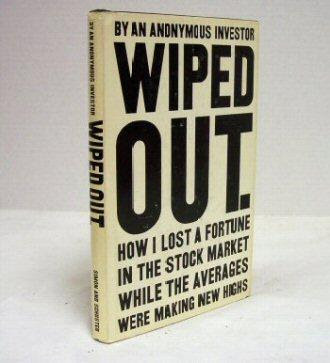 WIPED OUT: How I Lost A Fortune In The Stock Market While The Averages Were Making New Highs, By An Anonymous Investor. Simon & Schuster, N.Y. 1966. The first truly anonymous book I have done--the author is unknown. Certainly not Warren Buffett. One of those 'don't do what I have done' books- the 'totally galvanizing' confession of an amateur investor who at first made money in the stock market and then tried to make more money faster.. .
Failure is always fascinating. I shall be dealing with the Failiure (sic) Press this week-an obscure journal to which Stephen Fry was wont to contribute in the late 1970s. 'Wiped Out' for some reason comes in various different coloured d/ws -- no precedence has been established...no one has yet bothered. This is usually done with dated presentations and I have never heard of a signed copy. Can an anonymous person sign a book?